Summer means tomatoes and corn. It also means wax beans, stone fruits, lots of herbs, peppers of all kinds and eggplant. Wax beans in season are one of my summer favorites. I make them on their own and dress them with a mint pesto or put them into big salads like this one. I like to think of wax beans as the nice kind of folk-singing nun and green beans as the strict knuckle-rapping nun. The first needs almost no tenderizing; the second need a little more work to bring them around. Nun metaphors aside, this means I like to cook wax beans for just a few minutes and leave them with some bite. Green beans are (to me) better cooked for a little longer until they’re tender—not mushy, just tender. “Warm salads” are a bit of a misnomer. When made with greens and a mix of other ingredients, the salad itself isn’t warm; it’s the addition of a warm ingredient—in this case shrimp—that softens the greens a little and helps blend the flavors of the salad. Warm salads are a four-season favorite, perfect for heartier warm weather meals or lighter cold weather meals. The shrimp: Zest the orange and lemon and squeeze the juice (save the juice separately for the dressing). Mix the zest, tarragon, olive oil, salt and pepper in a small bowl. Add the shrimp and toss until coated. Cover the bowl and refrigerate for at least 1 hour and up to all day. The dressing: Pour the orange and lemon juice, 4 tablespoons of the olive oil and the soy sauce into a small glass jar with a lid. Shake very well. Taste and if the dressing seems a little tart, add the last tablespoon of olive oil. Add salt and pepper to taste. Store at room temp for a couple of hours or refrigerate up to all day. The salad: Heat a medium pot of salted water to a boil. Meanwhile, cut the ends off the wax beans and cut them in half. Stir the beans into the boiling water and cook until tender but not mushy, about 4 minutes. Drain and rinse under cold water. Drain thoroughly. Cut off the thick ends of the watercress. Take a look at the leafy ends and if there are any stems that look too thick to eat, just pinch them off. Wash the watercress and spin it dry in a salad spinner. Store the cress in the spinner in the fridge for up to a day. To put it all together: Heat a gas grill to high or build a strong charcoal fire. String the shrimp onto metal grill skewers and leave them at room temp. Put the tomatoes, cress and wax beans in a large serving bowl. Bring the dressing out to room temp if necessary. Grill the shrimp, turning them once, until pink and cooked through, about 5 minutes. Let them cool while you dress the salad. Shake the dressing very well. Pour enough over the salad to coat everything lightly. Taste a bean and a piece of cress. Add a little more dressing if needed. Also if needed, sprinkle salt and pepper over the salad and toss again. 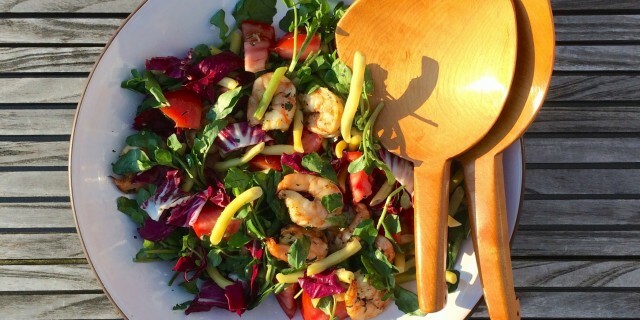 Slip the shrimp off the skewers into the salad, toss one last time and bring to the table. *WITF (Whatever’s in the Fridge): I had half a small head of radicchio, so in that went. If you have lettuce, baby spinach or any other green you’d like to use up, this is a good place to do it.